FAMILLE UNIQUE DE PLAIN, trois chambres, deux salles de bain GOLF Cottage avec garage. CUISINE ET BAINS NOUVELLEMENT RÉNOVÉS. 250 $. 00 DÉPÔT DE DOMMAGE REMBOURSABLE sera ajouté lors de la réservation. GOLF VIEW est idéalement situé à deux pas du club-house, du practice de golf, du tennis et de la piscine. L'accord d'adhésion permet l'utilisation de la facilité de la pratique du golf, tennis, piscines et salles à manger clubhouse. L’aéroport de Savannah (l’un des aéroports les plus faciles en avion) ​​est à 25 minutes en voiture. Plages Hilton Head, Tanger oulets pour le shopping sont à 20 minutes. Dans les 25 minutes sont un large choix de restaurants au choix. Charleston est à 75 minutes en voiture. Île Callawassie qui signifie «belle île» a été nommé par les Indiens Yemassee il y a plus de trois siècles. Île Callawassie est une communauté privée de golf et le tennis résidence fermée. Les premières communautés de SC à SC pour recevoir NATIONALE DE FAUNE FEDERATION certification comme Habitat arrière-cour de la faune. Callawassie est une île de la mer, à l'abri de l'océan Atlantique par l'île-barrière plus grande, Hilton Head, et est entouré de marais grouillant de limicoles. PRIX DU Tom Fazio remporté le championnat de golf de 27 trous, a profité de la beauté naturelle de l'île pour créer un drame visuel et superbe jouabilité. Magnifiques chênes et de magnolias, ainsi que des étangs d'eau douce ainsi, l'eau salée environnante marais entrent en jeu sur la plupart des trous. Shopping à Tanger Outlets et beaucoup de manger dans les 20 minutes. VEUILLEZ NOUS ENVOYER PAR E-MAIL POUR connaître les disponibilités et les tarifs, car le calendrier n’est pas toujours correct. CLIQUEZ SUR LIENS CI-DESSOUS POUR PLUS DE PHOTOS, D'INFORMATION ET de Callawassie ISLAND HOME PAGE. Great Home. Great location for golf tennis and more. We truly enjoyed our stay. Beautiful place. Owner Tom, was on spot if we had any questions or concerns, he returned our call with within minutes. I love to cook, kitchen was well equipped. Less than 5 minute walk to golf and tennis. If you are a golfer, fabulous 27 holes of pristine golf. Thank you. I appreciate you taking the time to write a review. Please keep me in mind for future travel. First off I want to say Tom was wonderful to work with. He was always a phone call or and email away. We had a small issue with the grill and he quickly fixed it. The house is beautiful along with the views. Everything was extremely clean. The bedrooms were perfect for the 6 of us. The house is kid friendly! The best part was the golf and the use of the golf cart! We drove the golf cart around for a bit to enjoy the views! There are some beautiful wildlife here! Everyone in Callawassie is friendly and helpful! We will be planning another family trip here soon!! Thank you Tom for sharing your beautiful home with us! Thank you very much for the business and the review. 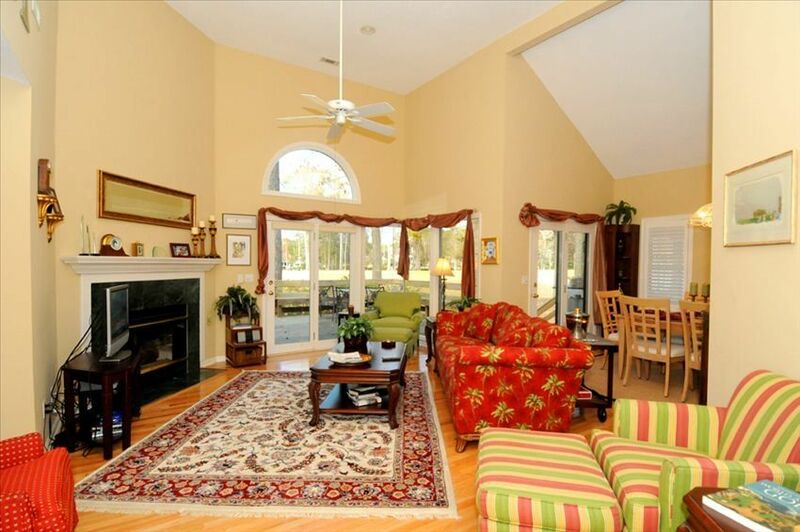 Absolutely stunning cottage with a view of a hole one on Dogwood Golf course. The Tasca family keeps the house is great shape. Tom is very easy to get a hold of and has all the answers in a quick return time. The cottage has everything you would need to feel right at home. The community if full of beautiful views and wonderful neighbors. You are treated with respect as if you owned your very own home on Callawassie. I loved my time so much I asked to stay another day. Thanks for the review. Your were a great guest. The entire booking process was smooth. We had a wonderful stay at the golf cottage. Everything was supplied and the cottage was clean and tidy upon arrival. We had a small issue which was addressed by the owner very quickly. It was so nice to be away from the hustle and bustle and just appreciate the abundance of nature every day. We saw deer, gators in the ponds and smaller critters on the golf course. I would highly recommend this cottage to anyone who is interested in staying near to Hilton Head or Charleston. Thank you for taking the time to write the review. I'm happy that my handyman was available on a Sunday to take care of your issue. Sometimes we do get lucky. Please keep me in mine for future travel. We had a very relaxing visit to Callawassie Island. The cottage was roomy and had everything we needed with a beautiful view of the golf course. The deck was a great place to sit in the morning with our coffee and watch the golfers. Having the golf cart and free golf made it so convenient to go out and just play 9 holes if you like. We also used the golf cart to check out the neighborhood and docks. We ate at the clubhouse several times and everyone - members and staff were very friendly...as were the people in the golf shop. Tom was easy to work with and very responsive. We would definitely recommend this cottage and plan to return! Thanks for taking the time to write such a detailed review. You were great tenants and hope to see you again. Mi-chemin entre la ville historique de Beaufort et de Hilton Head. GOLF COURSE WILL BE CLOSED JUNE 5 TO 9 AND AUGUST 1 TO 4 PLEASE USE eCHECK. THERE IS A 3.0% CHARGE FOR CREDIT CARDS YOU WILL BE RESPONSIBLE FOR. HALF THE DEPOSIT IS REFUNDABLE 30 DAYS PRIOR TO CHECK IN. ALL STAYS are subject to $100.00 cleaning fee.